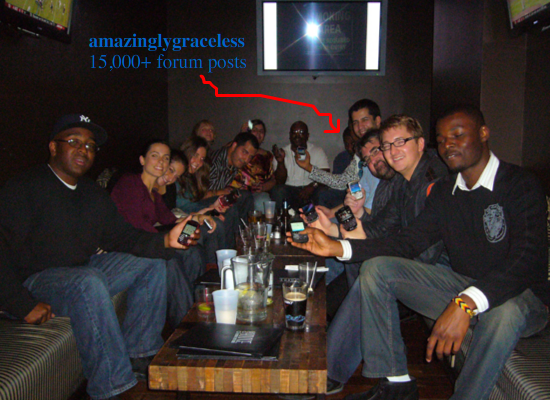 Congrats to AmazinglyGraceless for 15,000 CrackBerry Forums posts! Leave a comment to this post for your chance to win 1 of 5 $30 gift certificates for BlackBerry accessories from ShopCrackBerry.com! A site like CrackBerry.com is successful for a number of reasons, but reason #1 is our community. Sure, we have a passionate and dedicated editorial team keeping the blogs full of timely and helpful BlackBerry-related content, and our e-commerce team and affiliates deliver the best smartphone stores on the net. But at the end of the day it's our members who really make CrackBerry.com the awesome site and amazing resource that it is. We have several members who have now cracked the mystical 10,000 posts count in the CrackBerry forums, and one member who has now taken it to the next level of passing the 15,000 posts mark. Members in the forums will know the name - amazinglygraceless. Big congrats go to amazinglygraceless (AG) on the milestone. AG has been one of our forums moderators for a while now, and upon hitting the 15k mark has decided to retire from the modding life and go back to being a regular member, where he plans to keep contributing to the community. I asked him what I could get him as a 'retirement' gift but all AG wanted was for us to run a contest in recognition of how much we appreciate the CrackBerry community! Pretty graceful there amazinglygraceless. Contest - Win 1 of 5 $30 gift certificates for BlackBerry accessories from ShopCrackBerry.com: As a token of our appreciate for the awesome CrackBerry community that we have here, just leave a comment to this post for your chance to win! Contest ends this Sunday at midnight PT. Good Luck! And thanks for all the posts AG!